Crafted in real copper panels this contemporary style double-car garage door features a minimalist design. The star of this garage door is the copper paneling that has developed an exquisitely unique patina over a period of time. The natural corrosion of the copper surface has brought out the natural aging of the material giving it a uniquely appealing appearance. The five section, flush panel design falls in line with the simple architectural lines of contemporary architecture allowing the copper itself to shine through as the primary element of this home’s exterior. 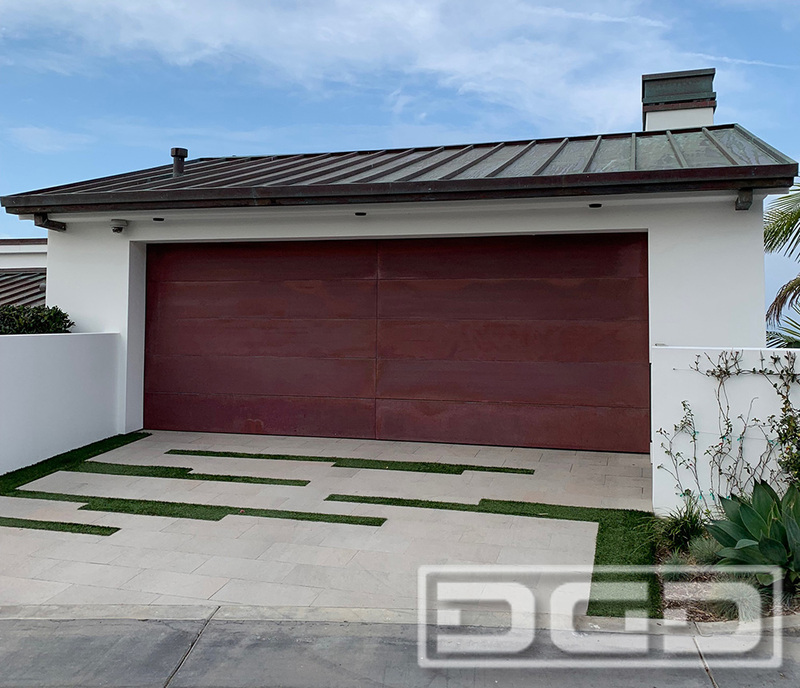 We custom craft contemporary style garage doors such as this in a vast array of materials including precious metals such as pictured here in copper as well as aluminum, stainless steel, cor-ten steel, corrugated steel and many others just to name a few! Contact our design studio to learn more about this copper garage door design or to inquire about our specific garage door design project.